This September, more than 3,000 athletes from around the world will compete at the prestigious IRONMAN 70.3 World Championship. Mooloolaba Beach, along the famed Sunshine Coast in Queensland, Australia, will be the setting for this year’s event. More than 3,000 athletes will participate, having first qualified at a previous IRONMAN 70.3 event. During a season, more than 130,000 athletes compete in 85 qualifying events held worldwide, in such locations as Australia, Germany, South Africa and Switzerland. According to IRONMAN, participants in this year’s IRONMAN 70.3 World Championship range in age from 18 to 75-plus, and will represent over 70 countries. The first IRONMAN 70.3 World Championship was in 2006 in Clearwater, Florida. It moved to Nevada in 2011 until 2014, when the event became global. Now, every year it takes place in a different worldwide destination. In 2017, it will be held in Chattanooga, Tennessee. The IRONMAN 70.3 is a triathlon and like most triathlons, it is comprised of three races: swim, bike, and run. The difference between it and an IRONMAN triathlon is in the total miles – it is a shortened version with 70.3 total miles. The IRONMAN is 140.6 miles. The first event is a 1.2 mile (1.9km) ocean swim. The bike race is 56 miles (90km) and is a combination of highway and Sunshine Coast hinterland, including an elevation gain of 2200 feet. The race finishes with a 13.1 mile (21km) run along the coastline, where fans can gather to cheer on the athletes. For more information about all IRONMAN competitions, check out their website: www.ironman.com/. Whether you are a first-timer, seasoned competitor or a fan – and no matter where the IRONMAN event is held – we’ve got you covered for low-cost, reliable Wi-Fi connectivity. Our coverage extends to 190 countries worldwide. 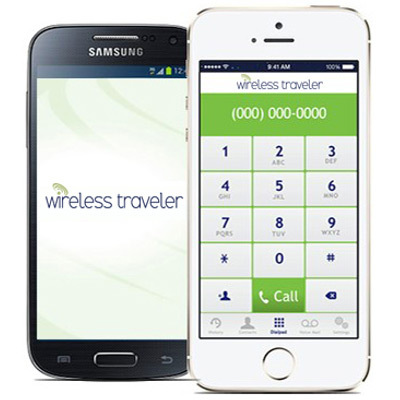 Download our Wi-Fi Calling App on your smartphone and you can call the U.S. for only two cents per minute – and you can call app to app for free. For a high-speed data connection, rent or buy our ultra-slim Pocket Wi-Fi. Enjoy the low cost data rates in Australia – just $125 for 1 GB, which the whole family can share on all of your devices, no need to buy separate data plans for each smartphone and iPad.